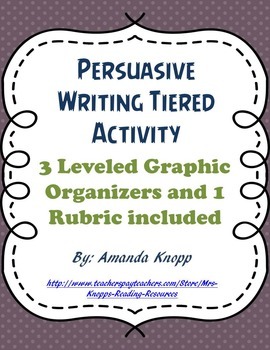 Teacher will introduce persuasive writing to the class using their own lesson. 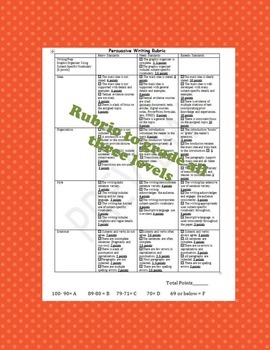 Three leveled differentiated assignments are included to show that all students can still meet the desired objectives and standards. 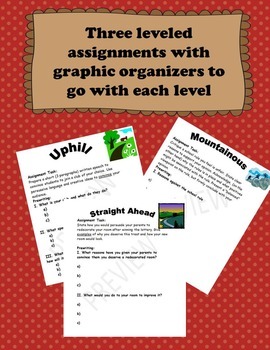 A differentiated assignment with a separate graphic organizer is provided for each level and a rubric to grade all three. 1)	Students will write a persuasive essay. 2)	Students will use claims and evidence to support their argument. 3)	Students will conclude their essay with a statement to support their argument. 4)	Students will use the writing process to develop a quality piece of writing. a. Introduce claim(s) and organize the reasons and evidence clearly.